Brand: CK Products 44-1508 Units: 1 set / 2 pcs. total Finished piece is 8 1/2" x 1 1/4". Make beautiful lace pieces with this silicone mold. May use rolled fondant, rolled buttercream, chocolate paste or any edible clay-like icing. Finished piece is 8 1/2" x 1 1/4". 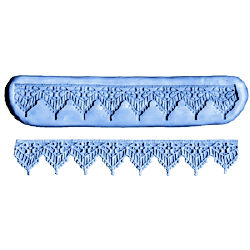 Make beautiful lace pieces with this silicone mold. May use rolled fondant, rolled buttercream, chocolate paste or any edible clay-like icing.